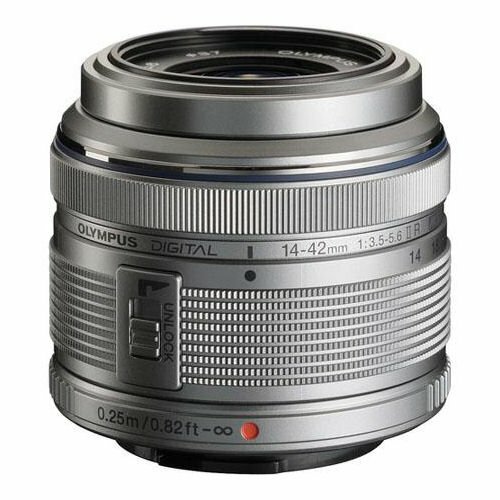 Boasting a brand new, optimized overall design, the latest generation of the M.ZUIKO DIGITAL 14-42mm f3.5-5.6 II R (35 mm equivalent focal length: 28-84 mm) has now arrived. This ultra-compact zoom lens delivers magnificent 3x zoom performance in a form factor as small as before in a renewed design. It is also equipped with MSC technology for superb videos and still pictures - with extremely high-speed, practically silent auto focusing and great movie sound even when zooming in and out. However fast your subject and however far away, this lens has the specialist capabilities to rise to the challenge and deliver stunning visual results. The lens ships with interchangeable decoration rings that perfectly match the colors of different PEN cameras. Angle of View 75 deg.-29 deg.